Montreal (AFP) - Toronto Raptors president Masai Ujiri apologized to DeMar DeRozan on Friday for "miscommunication" prior to the blockbuster NBA trade that sent DeRozan to the San Antonio Spurs for Kawhi Leonard. 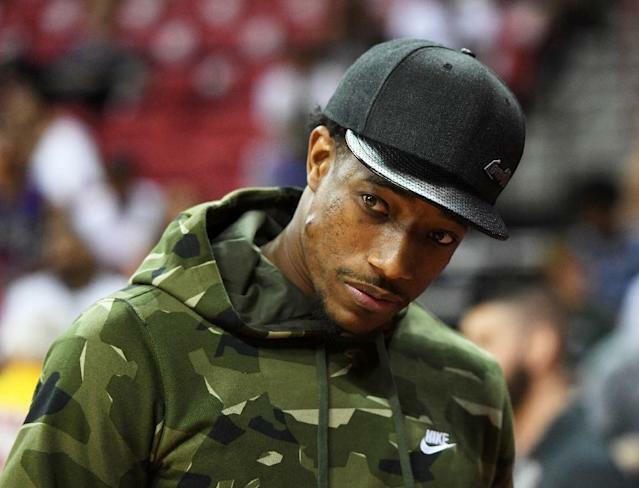 DeRozan, who had spent all nine of his NBA seasons with the Raptors, reacted angrily to the trade on Wednesday with an Instagram post saying "Told one thing and the outcome another. Can't trust 'em. Ain't no loyalty in this game." Ujiri said at a press conference at the Raptors' arena in Toronto that the chance to acquire two-time Defensive Player of the Year Leonard was simply too good to pass up. "I want to apologize to DeMar DeRozan for a gap of miscommunication, but also to acknowledge him, and what he's done here with the Raptors, for this city, for this country," Ujiri said. "I had a conversation with DeMar at Summer League, and I want to leave it at that. We spoke. I think maybe my mistake was talking about what we expected going forward from him, not necessarily about the trade," Ujiri added. DeRozan led the Raptors to five straight playoff appearances, but they were swept in each of the past two post-seasons by the LeBron James-led Cleveland Cavaliers. "You can't do this same thing over and over again," Ujiri said. "When you have a chance to get a top five player, we have to jump on it." The Raptors sent DeRozan, Jakob Poetl and a 2019 first-round draft pick to San Antonio in exchange for Leonard and Danny Green. Leonard played in just nine games for the Spurs last season because of injury as his relationship with the team soured. Leonard, who was known to desire a move to his hometown Los Angeles Lakers, has reportedly indicated he isn't interested in playing in Toronto long-term. Ujiri said the player "didn't express a lack of interest to play in Canada to me." He said he was confident Leonard would see that there was plenty to tempt him to stay in Toronto when his contract is up at the end of the season. "I think there's a lot of sell here, our team, our culture, our city," Ujiri said. "We have everything here except the championship in my opinion."